Blueberries are, without a doubt, my favorite berry. I recently splurged on a 32 oz pack of fresh blueberries, and it has taken a lot of will power to keep from shoveling them into my mouth in one sitting. I love baking with them, but pairing blueberries with butter and sugar doesn't do much for their nutritional content (this didn't stop me from making a blueberry pie on the 4th of July). Instead, I have been eating them for breakfast non-stop. They are so versatile when it comes to breakfast, and all those antioxidants are a great way to start your day. Here are a few of my favorite blueberry breakfasts! 1. 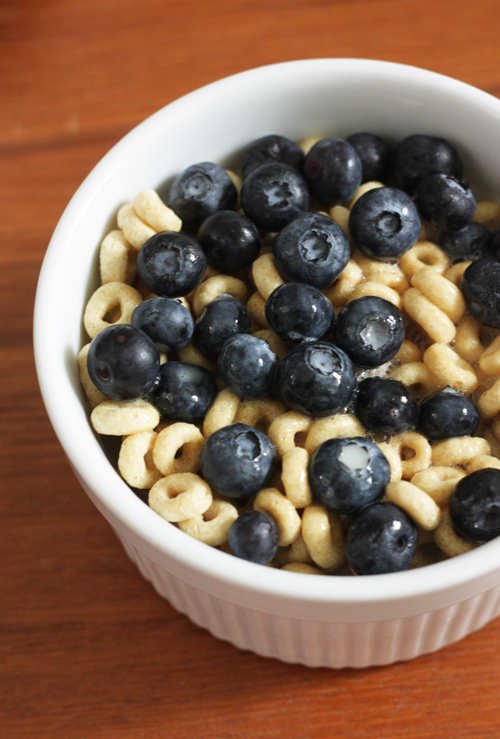 Blueberries with honey nut cheerios and soy milk. Probably my favorite way to eat blueberries in the morning. The blueberries get a little crushed and the milk gets all blueberry flavored. Yum! 2. 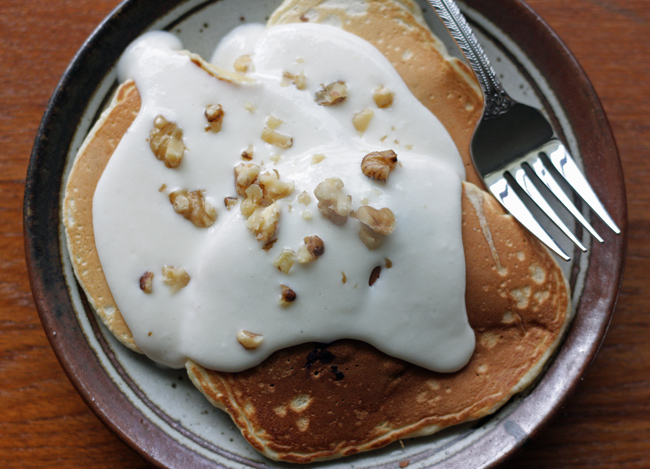 Blueberry pancakes with lemon zest and sour cream topping. Need I even say more? The photo above is from a previous post, you can find it here. 3. 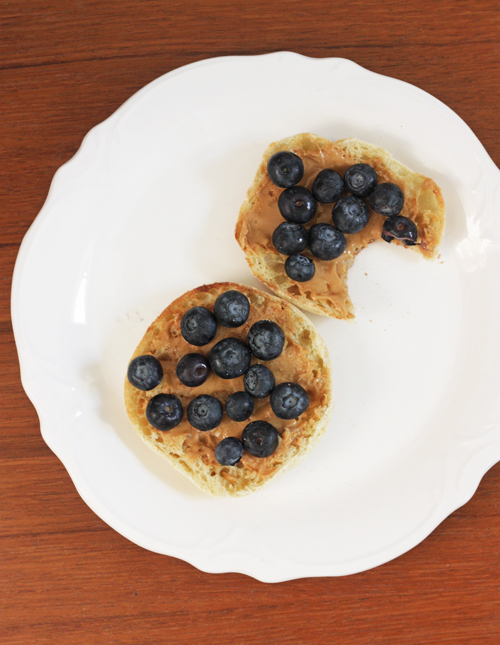 Blueberries on an english muffin with peanut butter. Think peanut butter and jelly, but better. A drizzle of honey on top would be delicious! 4. 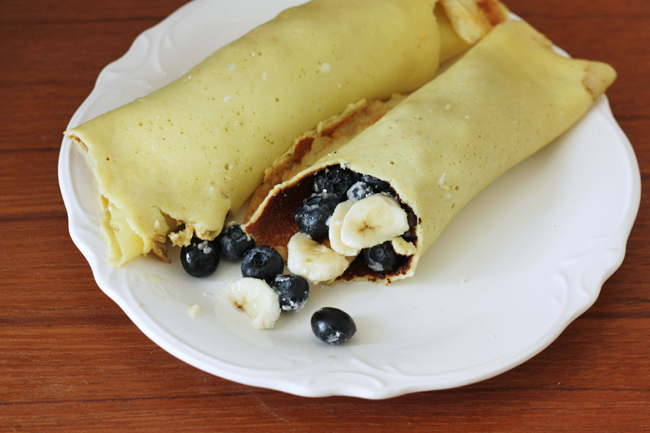 Swedish pancakes filled with blueberries, bananas and a bit of powdered sugar and butter. Swedish pancakes are the best. To make the pancake, I used this recipe. 5. 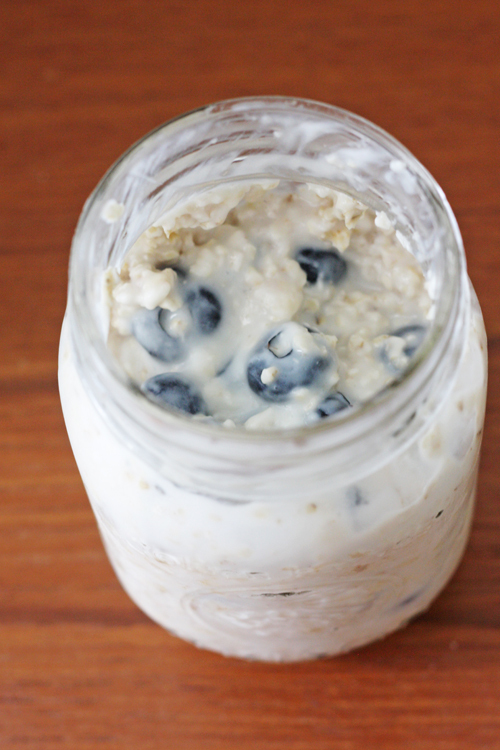 Overnight refrigerator oatmeal with blueberries and yogurt. I tried making this overnight yogurt recipe and really liked it! The texture of the oatmeal is good, and the blueberries give it a lot of flavor. I didn't use chia seeds like the recipe calls for, but I would love to give it a try!